One day, you’re throwing back 35 sticks of cinnamon Orbit on the White House press dais before lunchtime; the next, you’re staring down a 50-cent local call on a public pay phone. 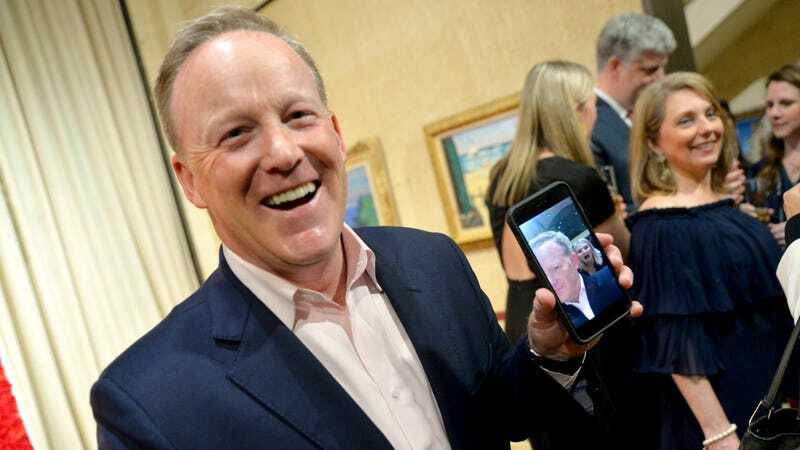 This has been, til lately, my bum-luck takeaway from passing glances into the window of the Sean Spicer story via the Sean Spicer Instagram feed in the ten months since his resignation. He’s no longer employed by the White House (he’s advertised as a “business speaker” on Worldwide Speakers Group), but he’s always been around. Here he is photographing the White House a month after his resignation; here he is on the lawn at the Macrons’ state visit; here he is at the White House Correspondents’ Dinner; here he is posting an image of the Washington Monument just because it “never gets old.” Sean Spicer has an unusually high number of bump-ins (the whole White House press team!!) and photobombs (a Buzzfeed reporter) and sightings (Paul Ryan accepting an award from afar). Nothing happened this year except for Sean Spicer. Sean Spicer is here. Sean Spicer is there. Sean Spicer is everywhere. Sean Spicer hasn’t gone away.